Do you always forget to bring essential items when you go on a picnic? 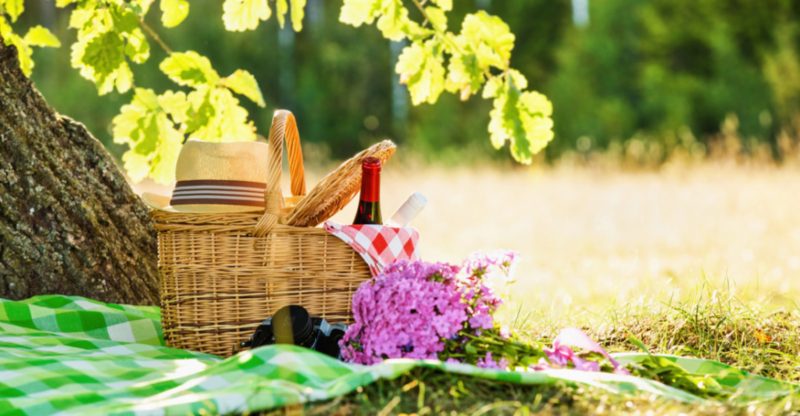 If you’re not sure what to bring to a picnic, here are 10 items to put on your checklist. There’s nothing quite like a picnic. It’s like a meal and a small adventure wrapped into one event. You can have solo picnics. But, most often they involve at least one other person because they’re a great way to socialize and get to know people. There’s a reason why so many films have great picnic scenes that reveal character and relationships. But successful picnics don’t just happen. You need some planning so that everyone can focus on enjoying the moment. At the top of your picnic checklist is choosing a location. After that, it’s all about what to bring to a picnic. Here are 10 picnic essentials to get you started. Let’s just say it. Food is the main attraction at a picnic. Get that right and you’re well on your way to a great event. The most important thing to consider when preparing or buying picnic food is how it will be eaten. Foods that can be eaten by hand without much mess are ideal. Obvious examples are potato chips and other snack food as well as sandwiches. But if you want something a bit more special, think about hors-d’oeuvres. Anything you might serve at a cocktail party could also work at a picnic. Of course, not everything needs to be finger foods. Many kinds of salads, including those made with pasta, quinoa, rice, or lentils, are popular picnic foods. Foods that can be eaten with forks, spoons, or chopsticks are best for picnics. Remember to include savory and sweet items on your picnic menu. Pack everything, including beverages, in resealable containers. Do your best to stay away from glass containers and serving dishes when packing for your picnic. They add extra and unnecessary weight and can break, causing a messy or injury. Plastic, resealable containers are ideal for packing food and taking home leftovers. Buy reusable plastic cutlery and dishes for serving and eating food. Eating from solid plates and with sturdy cutlery adds to the joy of the meal. Avoiding paper plates and disposable cutlery is also the eco-friendly choice. You can also find many elegant reusable drinking glasses at home improvement and kitchenware stores. To make clean up easier, pack an empty plastic tote or large bag to hold all the used dishes and cutlery. With everything in one place, washing them up at home is easy. You could even use the plastic tote to store the dishes and cutlery between picnics! Everyone has a different palate for salt and other seasonings. Help your friends and family enjoy the picnic meal by packing small resealable containers of seasonings that complement the menu. Sometimes, grated cheese is another popular flavor-enhancer for tomato-based foods. Don’t forget to bring basic kitchen tools to a picnic. The must-have items are scissors, cutting knife, corkscrew, and bottle opener. Also take serving spoons and forks, paper towel, a clean dishcloth, aluminum foil, empty plastic bags, and twist ties. If the picnic involves a barbecue or some kind of cookout, don’t forget matches or a butane lighter, oven mitts, and appropriate cooking utensils. Since eating is the central activity at picnics, make the experience as pleasant as possible with table and ground covers. Traditional picnics call for blankets. Stick with durable and washable fabrics that don’t produce lint. Many times, a tablecloth with plastic backing works well as a picnic blanket. Even if there’s a picnic table, draping a light-colored or pattern tablecloth over it can add a joyful touch to the meal. When packing up, shake out all blankets and tablecloths. That can save you from dealing with debris and small critters like ants back at home. Many times, picnics are drop-by events. Guests will come and go so you can never be sure how many people will be there at once. Taking a few folding chairs or camping stools with you is always a good idea. This is especially true if the guest list includes people who aren’t comfortable sitting on the ground or standing for long periods of time. For added fun and if you have space, consider packing a portable hammock! If you’re lucky, the sun will be out during your picnic. Feeling the sunshine on your face is one of the pleasures of picnics! But it also raises the importance of having ways to keep everyone and everything cool. Your picnic checklist should include hat, large umbrella, and maybe a small pop-up canopy. Sunscreen is also a smart idea. To keep food cool and fresh, use insulated containers or bags like NorChill with ice packs. Use a separate one for beverages. Since it will likely be opened more often, this helps keep food cooler for longer. If there’s running drinking water at your picnic location, consider taking empty plastic jugs. You can fill them when you arrive to save money and lighten your load. Otherwise, include fresh drinking water among your beverages, the same way you’d include it in a camping backpack. Water is always the best option for staying hydrated while enjoying outdoor fun. Soap and warm water is the best way to clean hands. But that’s not always an option at picnics. That’s why you should put hand wipes on your list of picnic essentials. They aren’t as effective as soap and water but they are better than nothing. For best results, remove as much dirt and grease as possible from your hands before using the wipes. Great picnics are filled with a variety of activities. From lazing around to playing team sports and going for hikes, a lot goes on at picnics. And sometimes, accidents happen. Most only cause minor cuts and bruises. But it’s still wise to have a well-stocked first aid kit on hand. You can buy a ready-made kit or put one together yourself. Either way, pack it alongside the food and supplies. It won’t take up much remove but could be invaluable if you need it. Now that you know what to bring to a picnic, you have the foundation of a successful event. But it’s your attitude that can make it a smash hit with friends and family. Approach planning your picnic with a joyful outlook. Think of what you need to keep everyone active, fed, hydrated, and safe. Keep your list simple yet comprehensive. Your good planning will pay off the day of the picnic when you can relax and enjoy the moment. Want more tips and information you can use for planning and enjoying picnics? Check out our sports blog and travel blog categories!